Originally, I was worried my Forge World order wouldn’t arrive for another week, luckily, my entire order arrived Thursday evening. With an Adepticon primer tournament at my local Games Workshop taking place that coming Saturday, I had a clear goal in mind: Have the army built by Saturday morning. Even with a tight timeline, I had to ensure that I’d only play if I didn’t rush and risk the end result of my models being degraded due to my desire to play them in this tournament. Amazingly, my army was almost completely built by Saturday, the remaining models legal in the tournament. Building 65 infantry models, 5 field artillery batteries with their crews, along with a Medusa siege carriage was no easy task. The longest endeavor was the soaking and subsequently scrubbing all the parts to remove the release agent from the resin models. After they were dry, the parts were checked for excess resin and warping. The casting on most was very good, no mold lines were on them at all. I used a hair dryer set to low speed and at a high temp to fix any warping. Then, the infantry models had their helmet Aquilas removed with a hobby knife and filed down with a fine file. After that, it was build by numbers. The Death Korps range doesn’t always lend itself to customizability, as their trench coat folds need to line up with their respective pieces. However, you can find pieces that the directions don’t intend you put together that make for some unique poses to spice up your army composition. You can even take casting mistakes and use them to your benefit. I actually found one of the infantry had been cast without an ankle, which I then used the end of a toothpick to create a prosthesis for him. Now I have a more characterful model due to creativity and the issues that can arise with resin models. Saturday morning dawned and I finished with just enough time and I was satisfied with the look of my models. While I was in it to win it, I knew going in that I’d face lists made to withstand some of the harshest builds that can be found in Adepticon and that I’m not the best competitive player. 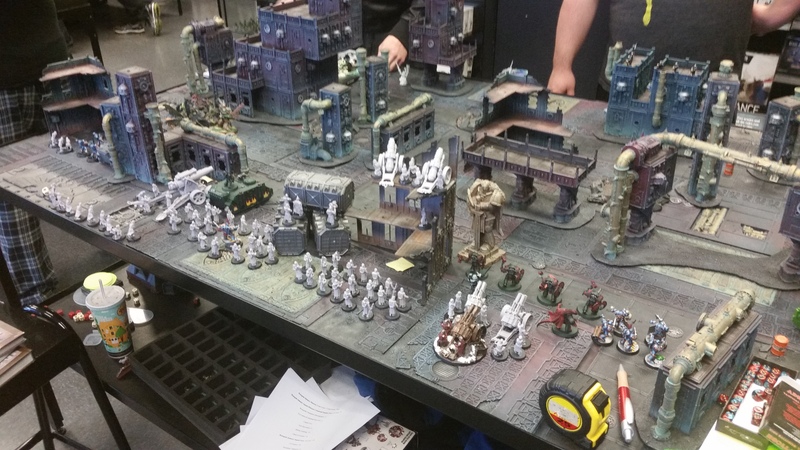 However, my list was nothing to sneeze at: 715 points of Renegades with a 280 CAD of Night Lords ( 1000 points was the limit set for the tournament and to be able to field a unique detachment or formation, I had to be able to have a normal CAD accompanying it to be legal in the tournament). I used a Renegade Detachment found in The Siege of Vraks Vol. 2 , known as The Purge. All my Renegades had to be Covenant of Nurgle and I needed one HQ and two Elites to use the detachment. The notable benefit was that all Barrage weapons in the army gained the Salt of the Earth special rule. 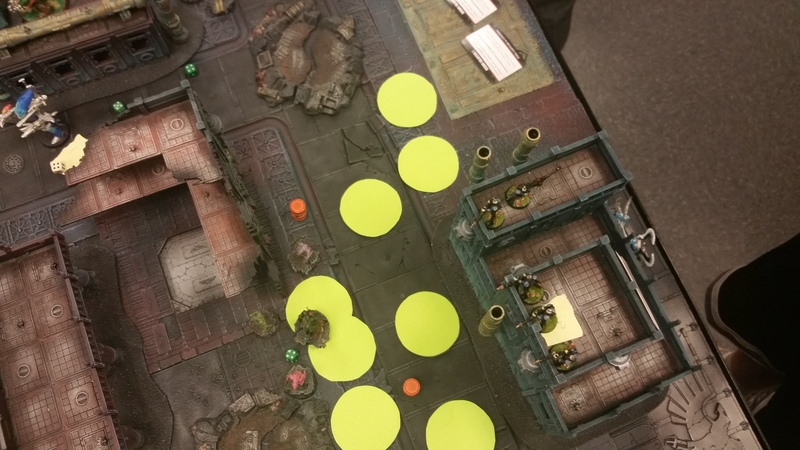 The rule made it so all templates from barrage weapons after being resolved are set down on the table and become dangerous terrain. All of my artillery is Barrage, meaning that a unit of three Thudd Guns laying down 12 3″ blast templates at Str 5 Ap 5 just became a whole lot more of a hassle for many enemt units. My Demagogue also took Ordnance Tyrant for his Devotion, meaning my Medusa became an elite choice and my Field Artillery Batteries became troops but could also be fielded as heavy support if needed. Artillery within 12″ of me can also fire upon enemy units even if friendlies are under the template. Danger close approved. The tournament went well. Along with having great teammates and opponents, I had two close games (games were decided by achieving primary and secondary objectives, both times I tied in the primary but lost slightly in the secondary) and finished the third round with a win, loosing only one renegade. My army did what it was supposed to do, hammer the enemy from a distance and turn objectives they held into barren wastelands of dangerous terrain and the broken bodies of my enemies. Having 50 renegades in the backfield holding objectives was also a big deterrent for my opponents seeking to break the line into our zone. All in all, I think this army is a good start for gaming but can be improved upon. For now, I’m back to getting them ready for Inner Circle.